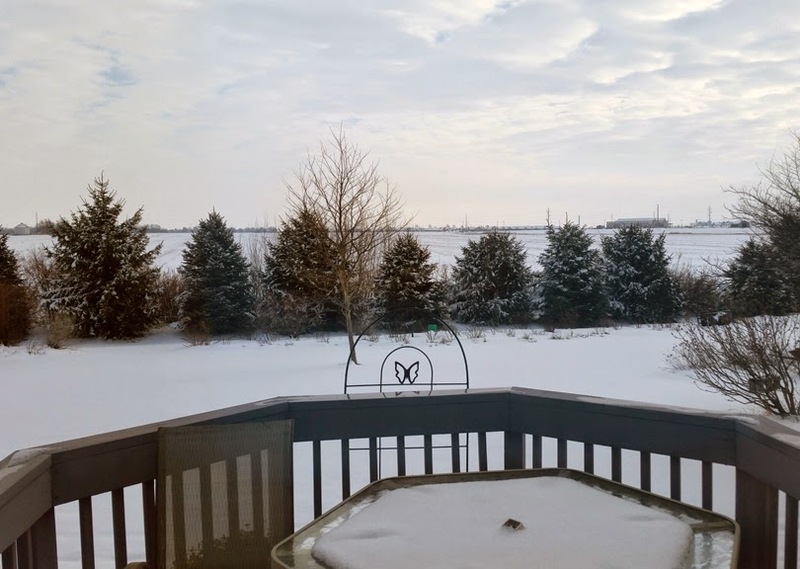 Isn't it time for Spring already? Even though it's not warm outside yet, this is the time of year that I switch gears into warm weather sewing. 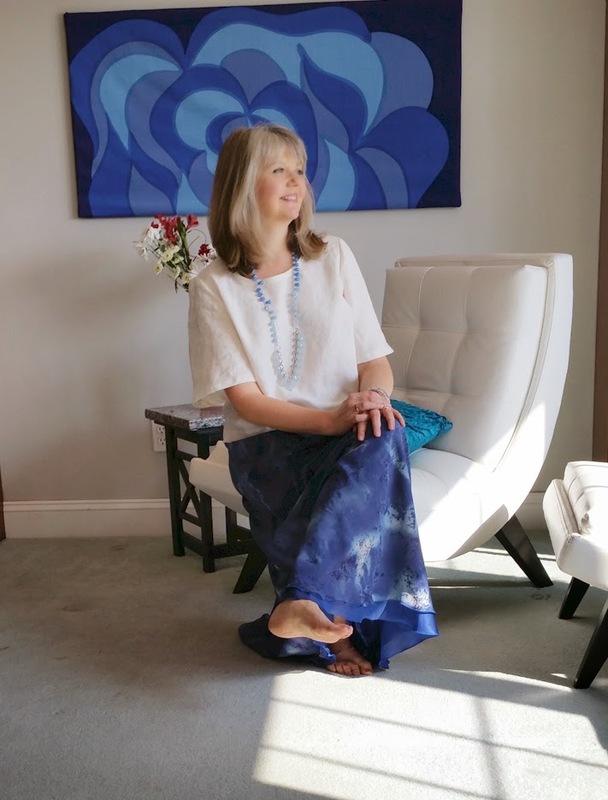 And there is nothing that feels Spring-ier than a beautiful silk chiffon skirt! There is nothing nicer than shedding those winter boots and tights and feeling the lightness of silk against your skin! 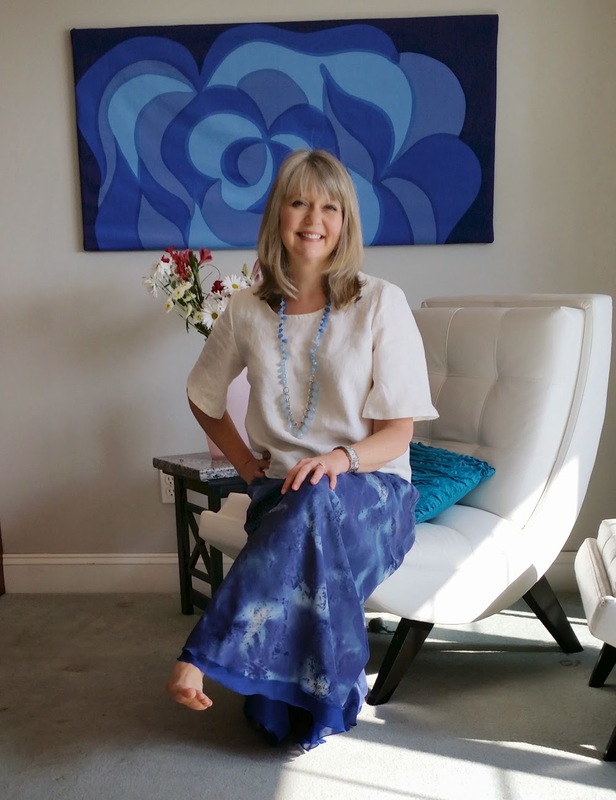 Have you checked out the Buy the Piece section at Fabric Mart lately? They have some nice size cuts of gorgeous silk chiffons. I got this 4 yard piece of Blue Tie Dye look silk chiffon from that section. I knew that I wanted to make a skirt out of it, but I debated on what kind. Midi or Maxi, pleated or straight? 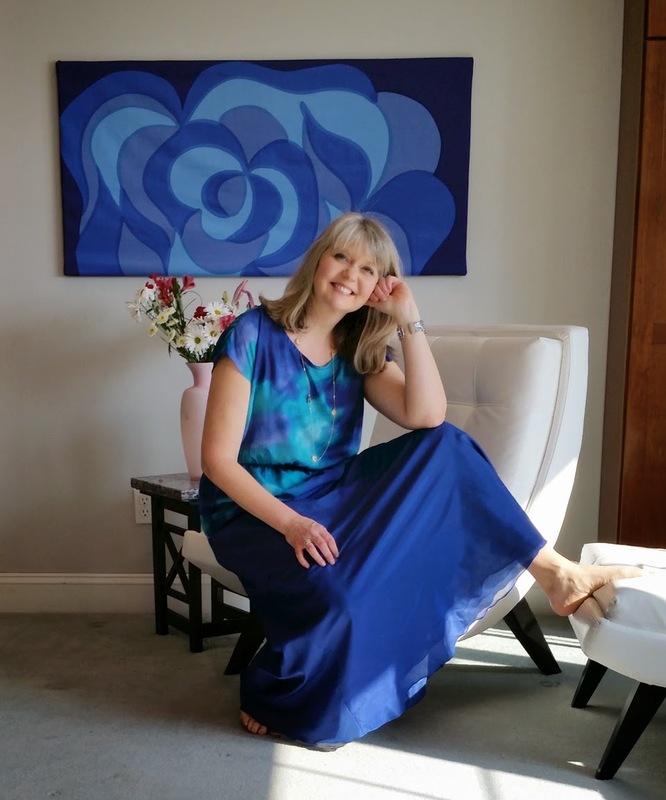 With such a pretty and delicate fabric, I thought it would be best to choose the simplest design possible, and let the fabric do the talking. 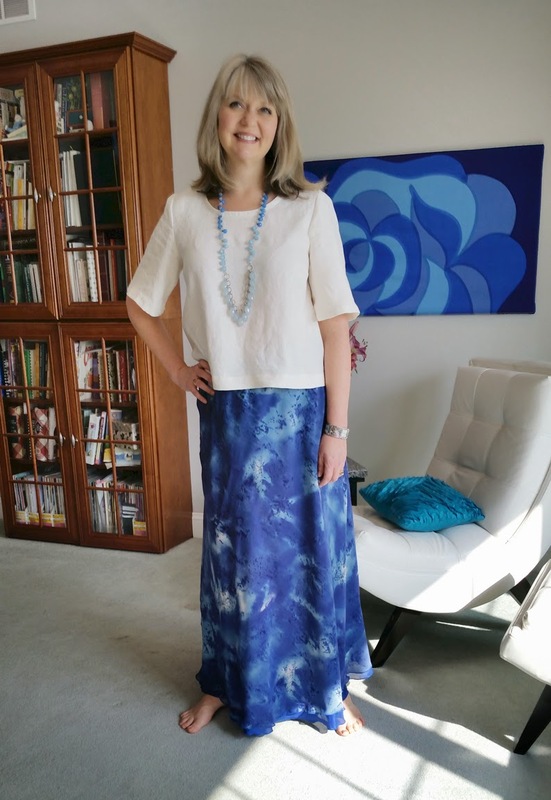 I decided on a bias cut maxi skirt pattern, Kwik Sew 3097. 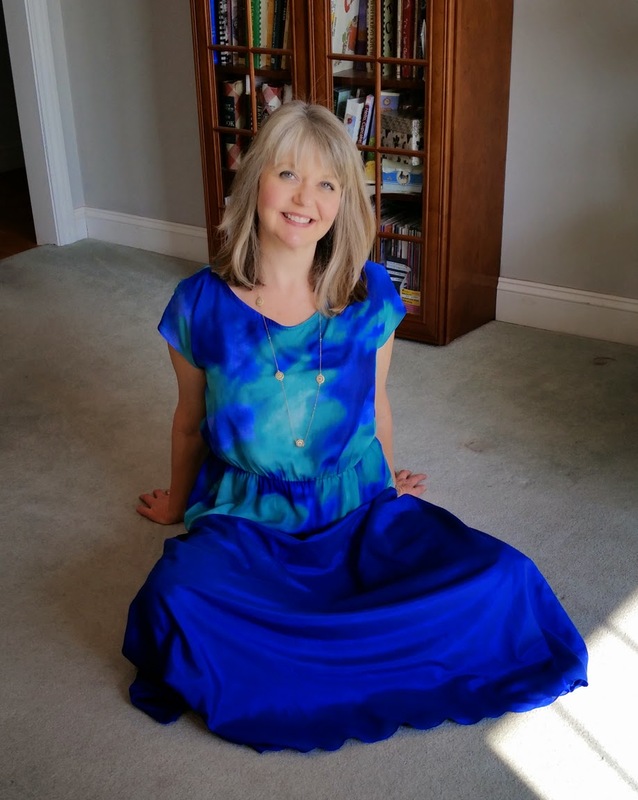 It's not longer in print, but just about every pattern company has a similar bias cut skirt pattern that you could use, such as this one from Pamela's Patterns. The neat thing about the Kwik Sew one was that it was reversible! I was going to line it anyway, so why not get two skirts for the effort of one? The pattern is just one pattern piece. You really couldn't ask for a simpler pattern. 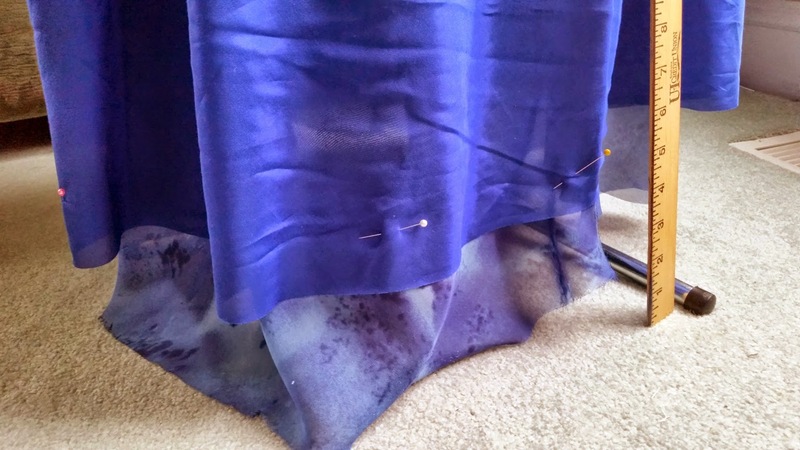 I lined it with a royal blue silk/cotton blend voile that I had purchased the previous year. Silk/cotton voile is my absolute favorite fabric. It has the luminosity of silk with the comfort of cotton. Both the silk/cotton and the silk chiffon fabrics would have been too sheer to wear alone, but together, they provide just the right amount of opacity, without feeling too heavy. I knew that when wearing the skirt, if each layer is hemmed at the same length, the underneath layer will occasionally peek out. So the fabrics needed to coordinate fairly well. 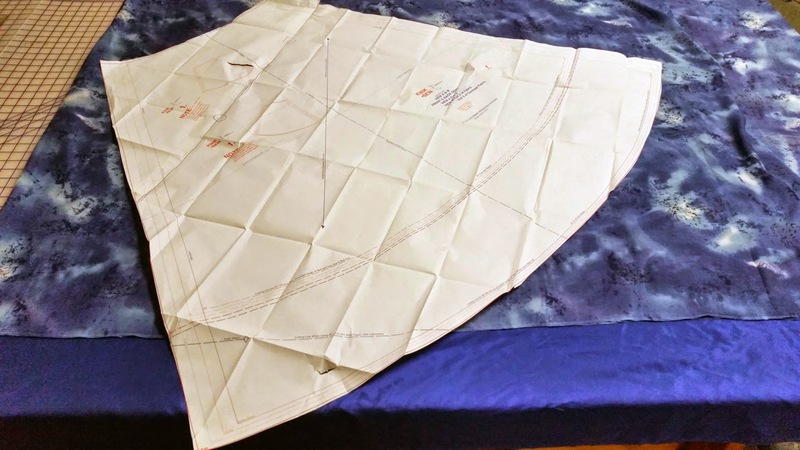 Here is the pattern piece laid onto both of my fabrics. I cut them all at the same time using a rotary cutter. 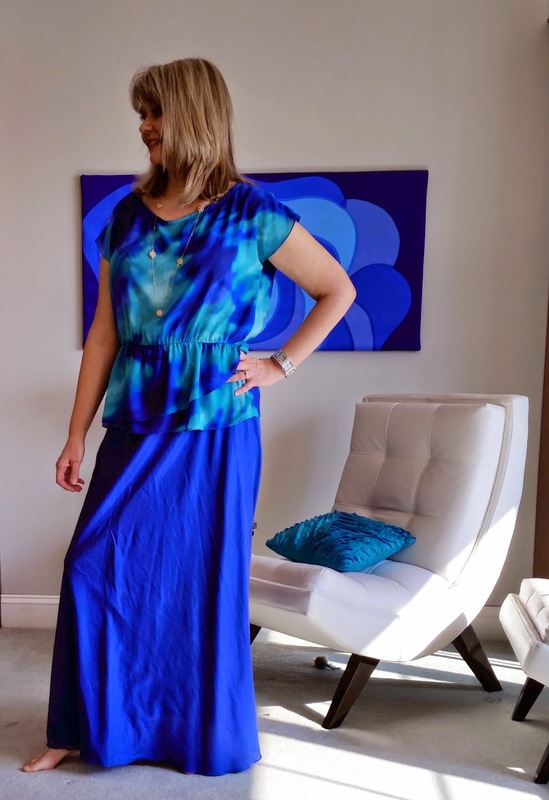 The chiffon was only 45" wide, so to get to the maxi-length, I needed to add an additional section to a corner of each piece. 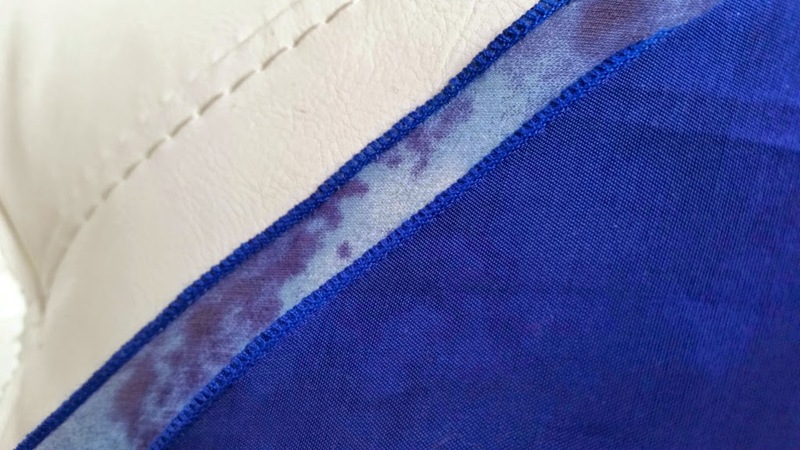 Here is a close-up of the pattern where this section is. It blends in so well, that you can't even notice that it's been pieced. The blue solid silk-cotton was 54" wide, so it did not have to be pieced. When working with bias, you have to hang your garment for at least 24 hours before you hem it. That is because most fabrics cut on the bias will grow unevenly. After 24 hours, this is what mine looked like. Even though I cut the solid skirt and the print skirt the same exact length, the chiffon grew several inches longer. To even it out, I put it on my dress form, and walked a yardstick around the bottom, pinning at the same level. Then I trimmed off any excess. 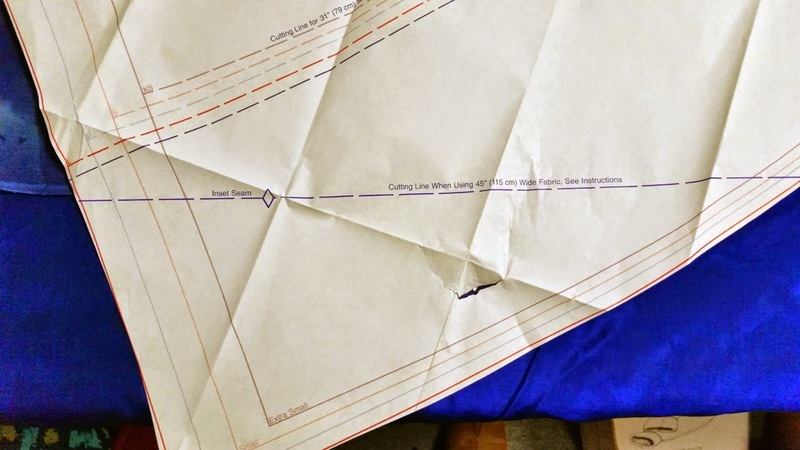 Hemming a bias cut fabric can be super tricky. 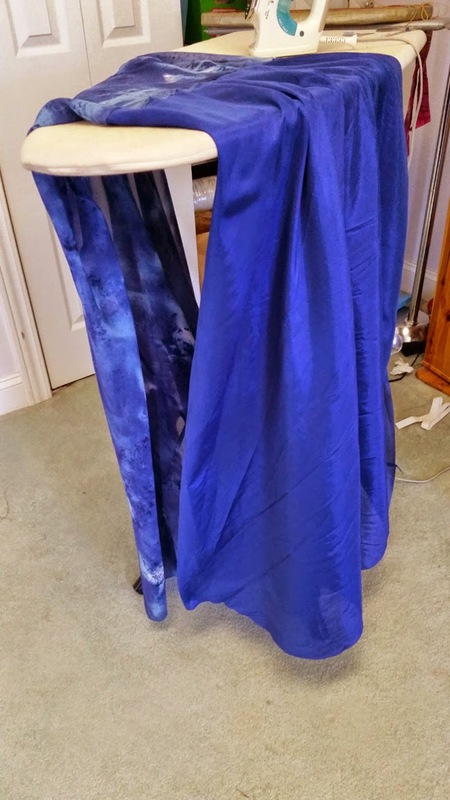 So, to avoid the frustration of trying to do a narrow hem with my sewing machine, I set my serger to the rolled edge setting and finished both skirts with a royal blue serger rolled edge. 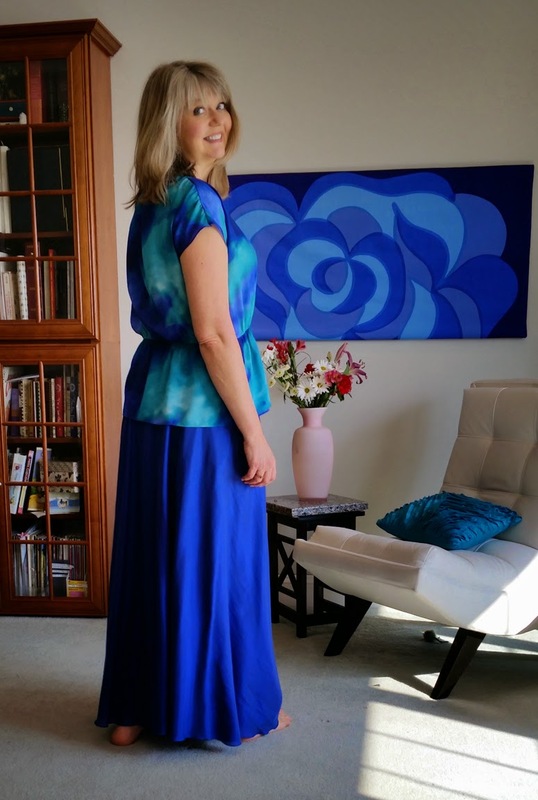 The way you make this garment reversible is to sew the two skirts together at the waist. You then make a casing for elastic with the seam at the very top of the casing. Here you can see both skirts sewn together at the waist. I thought that I would like the printed side best, but I have so many tops that will coordinate with the solid side, that I think it's a toss up! The maxi-length is so great because you can sit cross-legged on the floor and not worry about anything. You can get down and play with the kids, or your pets, and relax. So, it will be a while before I can wear this outside, but when Spring gets here, I'll be ready! Wow Ann, This is DARLING! I am so ready for spring I can hardly stand it! Thanks for the inspiration!!! I love this, I'm definitely putting at least one reversible skirt on my to do list for spring/summer.